So, you’ve made your millions, and now you want to know how to cash out Bitcoin? Well, this guide will tell you everything you need to know! No matter how big or small your balance is, we will show you exactly how to turn Bitcoin into cash. Today I will explain the different ways you can exchange your Bitcoin for cash. This will include methods including: bank transfer, PayPal and even through cash deposit! I will show you how to do this using a broker and through a peer-to-peer exchange. And to make it easier for you, I will also include some helpful images. By the end of this guide, you will be able to decide which method is best for you. So, let’s discover some of the different cash out methods! Cool fact: Did you know that more than $2 billion worth of Bitcoin transactions happen every day?! 4 How to Cash out Bitcoin using a Peer-to-Peer Exchange? Do you want the easiest method or the cheapest method? Do you want the money deposited in to your bank account or PayPal? How long do you want to wait to receive your cash? Which currency do you need to change your Bitcoin in to? These are some of the questions that you will need to ask yourself. So, read through the following methods and then decide which is best for you. A third-party broker is just another name for an exchange. Most cryptocurrency exchanges do not allow you to deposit funds using fiat money, however, some do. 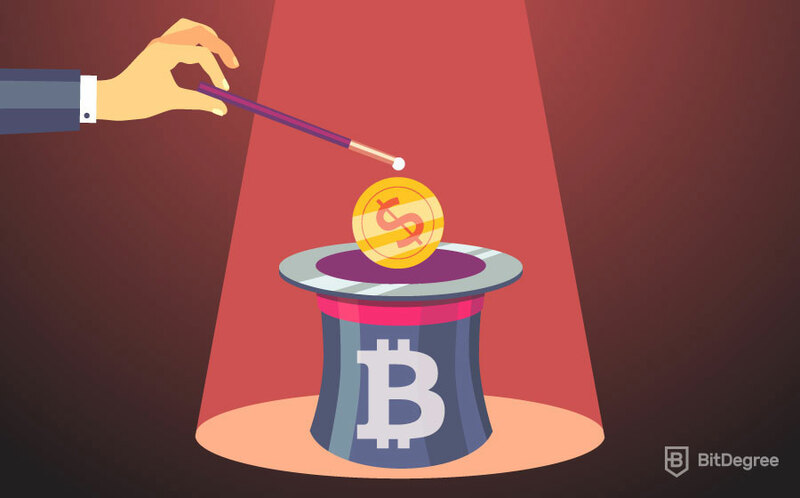 How it works is like this: You deposit your Bitcoin into the exchange, then once the exchange has received your Bitcoin, you can request a fiat currency withdrawal. The most common way to do this via a bank (wire) transfer. To make sure brokers do not break money laundering laws, you will need to withdraw to the same bank account that you deposited with. If you have never deposited fiat on to a broker exchange, then you will more than likely need to make (at least) one deposit first. This can be annoying, I know… but that’s the way it goes. If you decide to cash out your Bitcoin using a broker exchange (such as Coinbase), then it will normally take about 1-5 days for the money to reach your account. For EU customers, payments are made via SEPA (withdrawals paid in Euros). However, if you want to sell Bitcoin for USD, brokers normally use the SWIFT payment method. And that’s how to cash out Bitcoin using a broker exchange — skip the next section to follow instructions on how to do this. However, if you’d prefer the more anonymous, time-consuming approach, let’s look at how to sell Bitcoin for cash using a peer-to-peer platform! If you don’t like the thought of having to wait three days to turn Bitcoin into cash, you should consider using a peer-to-peer selling platform like LocalBitcoins. Cash deposit: You can ask the buyer to deposit cash in to your bank account. However, you should always ask them for proof of ID and proof of Payment before releasing your Bitcoins to them. Bank Transfer: You can ask the buyer to send you a bank transfer payment. Again, you should always request proof of ID from the buyer before going ahead. Once you have received the money, you can release the Bitcoins to them. Meet in person for cash: You can arrange to meet up with a buyer who is local to you, and they will pay you in cash for your Bitcoins. P2P selling is safe if you know what you’re doing. However, it’s important to be aware of fraudsters. LocalBitcoins offer a good level of safety because they off an escrow service. This keeps your Bitcoins locked until you confirm the payment has been received from the buyer. John wants to buy 1 Bitcoin. As he is from the UK, he searches for sellers in his country. John sees that Mike is selling 1 Bitcoin at a good price, and he also accepts bank transfer as a payment option. John sends his request for 1 Bitcoin to Mike, and Mike accepts. Mike puts his 1 Bitcoin in to the escrow. This holds the Bitcoin until John transfers the money to Mike. John transfers the agreed amount in to Mike’s bank account. When Mike has received the payment, he releases the Bitcoins from the escrow, which is then sent to John’s account. That’s it! Now you know how to sell Bitcoin for cash using a P2P exchange! So, now that you know the difference between the two favored methods, I will now show you how to withdraw bitcoins to cash using broker exchanges! Coinbase is the most popular broker exchange for buying and selling Bitcoin. They process more Bitcoin transactions than any other broker and have a massive customer base of 13 million. Withdrawal Methods: Coinbase lets you sell Bitcoins for cash, which you can then withdraw into your bank account. You can only cash out your Bitcoin into a bank account that you have already used to buy cryptocurrency on Coinbase. So, if you haven’t done this yet, I recommend purchasing a small amount of cryptocurrency first. Fees: The fees depend on the country that your bank is located in. For example, if you want to sell Bitcoin for USD, a wire transfer is $25. If you are located in the EU and have SEPA, then this costs just $0.15! For more information on Coinbase withdrawal fees, click here. Cash out times: Withdrawal times also depend on the country that your bank is located. US withdrawals normally take between 4-6 working days, while EU withdrawals take 1-3 working days. To make things a little easier for you, I will now show you how to cash out Bitcoin at Coinbase. First, you will need to open an account with Coinbase, link your bank account and make a deposit. If you need help on how to do this, view our guide here. If you have already done this, proceed to step 2! Once you have set up your account, you will need to send your Bitcoin to your Coinbase Bitcoin address! To do this, click on the accounts tab, open your Bitcoin wallet and click “Receive”. You will then be shown your Bitcoin Coinbase wallet address. This is the address you need to send your Bitcoin too. Once you are all set up, click on Buy/Sell at the top of the page. Assuming you have now sent your Bitcoin to your Coinbase wallet, you will see here your Bitcoin wallet and your default fiat currency. In the example image below, I opened an account from the EU, so my deposit wallet is in Euros (EUR). This will change depending on where you are located. For example, U.S customers have the option to withdraw to USD and Japanese users can withdraw to JPY. You will also see your withdrawal limit. If you have already verified your account, your limits will be quite high. However, if you need to increase this, click on See Limits and follow the additional verification instructions! Before you can withdraw, you need to exchange your Bitcoin to your local currency. 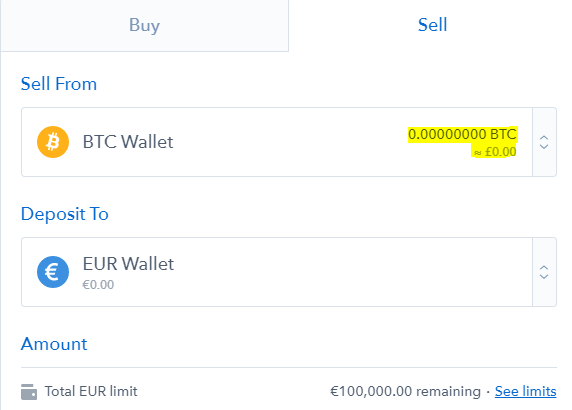 In my example, I am exchanging Bitcoin to Euro (EUR). Enter the amount of Bitcoin that you wish to sell, and the fiat currency equivalent will update. Once you click on Sell Bitcoin Instantly, your funds will now be in your fiat currency wallet. Finally, to cash out Bitcoin to your bank account, click on your fiat currency wallet (for example EUR/USD/YEN) and click on withdraw! Your bank account details will already be saved from when you set it up earlier. Congratulations! 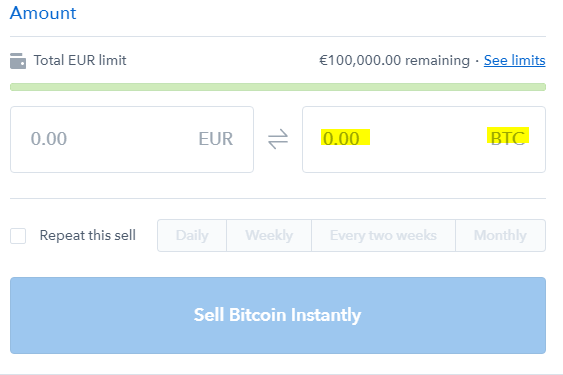 You now know how to turn Bitcoin into USD, EUR and other fiat currencies using Coinbase! Don’t forget, there are many other brokers that you can use. Another popular choice for Bitcoin sellers is Kraken! Kraken is another popular exchange that allows fiat currency deposits and withdrawals. It has been around since 2011 and processes the most Bitcoin to Euro transactions. However, they also support other major currencies like USD, CAD, and JPY! Withdrawal Methods: If you want to turn your Bitcoin in to cash with Kraken, you can withdraw to your local bank account. Fees: The withdrawal fees at Kraken are very low. For example, a SEPA cash out is only €0.09! And if you want to sell Bitcoin for USD using a local U.S bank, it’s just $5.00! For more information on Kraken withdrawal fees, click here. Cash out times: It takes between 1-5 working days for Kraken withdrawals to reach your bank account. How to Cash out Bitcoin using a Peer-to-Peer Exchange? LocalBitcoins was created in 2012 and now supports almost every country in the world. So, no matter where you are from, you should be able to find buyers to sell your Bitcoin to. Sellers can also choose the price they would like to sell their Bitcoin for. You can do this by creating an advertisement, which will charge you a fee of 1% of the total sale. However, if you sell to a buyer that has listed the price they want to pay, there are no fees. There is also a rating system like eBay, where you can leave feedback for the buyer or seller. This helps you to remain safe when choosing a buyer. If you are a beginner, I only recommend selling to buyers who have 100% positive feedback. Local Bitcoins allows you to stay anonymous too. However, some sellers decide to ask new buyers (those who have no feedback) to supply identification. First, you will need to open an account at Local Bitcoins. You can do this by clicking here. Choose a username and a strong password. You also need to enter and confirm your email address. Once you are logged in, click on Sell Bitcoins at the top of the page. Then you need to choose the country where your ideal buyers are located. I recommend using your own country (of course), however, this is up to you. In this example, I have selected the UK. You also need to enter the amount of Bitcoin you wish to sell. As you will see below, there are many different ways to cash out your Bitcoin. In this example, I will show you how to cash out Bitcoin using PayPal. As you can see, the buyer has a 100% feedback rating, and has completed more than 1000 trades! This is a sign of a serious, legitimate buyer. Confirm the amount of Bitcoin you want to sell and enter your PayPal email address. Then click on Send Trade Request. Your buyer will then receive a notification to say that you would like to sell your Bitcoins to them. Once they accept, you will then send your Bitcoins to the LocalBitcoins escrow (we explained an escrow earlier, remember?). So, the buyer will not receive your Bitcoins until they have paid you, and you confirm they have done so. The buyer should contact you to let you know that the funds have been sent. Check that the funds have arrived in your PayPal, then click on Payment Received and your finished. Congratulations! You now know how to cash out Bitcoin using a P2P exchange. Once you become more experienced on Local Bitcoins, you can practice selling using the different payment methods. The good thing is, some payment methods allow you to sell your Bitcoins at a higher price — so it’s worth getting used to. It is also a good idea to set up an advertisement. Even though it will cost you 1% in fees, you can set up your own price and choose your own payment method. In this case, you will receive a notification from buyers when they want to buy from you. LocalBitcoins is just one of the P2P exchanges that allow you to cash out your Bitcoin — there are many others. The important thing to remember is that the exchange has an escrow, and NEVER send your Bitcoin to a buyer before they have paid! 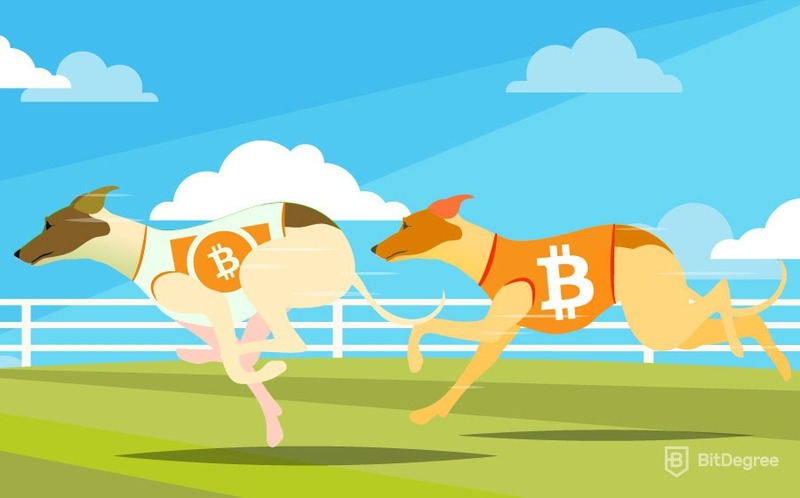 If you have read our guide from start to finish, you should now know how to cash out Bitcoin! We have shown you two different methods — the broker exchange way and also the peer-to-peer way. They both have their advantages and disadvantages. Coinbase can be more convenient and safe for beginners, whilst LocalBitcoins allows you to remain anonymous and sell at a higher price. So, which did you prefer? Are you going to use a broker to cash out Bitcoin, or a P2P exchange? Thank you for your great and detailed article. That would be great if you could discuss about ATM withdrawals which accepts cryptos! Okay, I missed something, and I apologize for asking my question this way: I want to get involved in a very simple day trading program. To participate, I will need to set up a $3,000 brokerage account. Can I simply used a bitcoin debit card to do this? What’s your email address? Let’s talk. On 22 Novemer, I invested £200 in a Bitcoin account .. It started trading to 250 euros then it was blocked and I was informed that the Company needed another 300 euros in order to continue or to get my money back . I requested that they just send me my original £200 this was on 24 November .. I received an Email saying that my request was under revue and I should be informed as soon as a decision was made ..But the agent still insisted that they needed another 300 euros. To continue. In the meantime I receive between 5 & 7 calls a day from different companies trying to get me to trade they are all on the 020 line . I have informed my Bank and explained the position, as I was not made aware of the fact of extra monies being needed and that I cannot trade anyway. Fortunately they have blocked my account so no more monies can be taken. I now do not know what to do. Your comments would be appreciated. Does one need a bitcoin atm card to withdraw bitcoin from his wallet? What if you don’t have a checking account to deposit remaining funds. Has anyone transferred bitcoin balance (anyway they wish) into an EMPTY normal bank account and withdrawn all the balance as cash? All comment on the balance on screen, the balance transferred etc but no one has said that they have directly deposited and withdrawn that amount as cash.